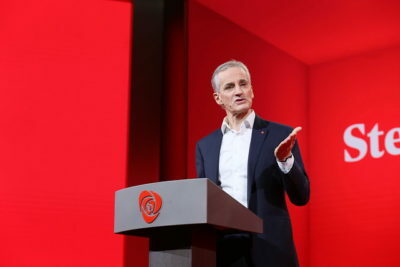 Labour Party leader Jonas Gahr Støre faced more disappointing public opinion poll results as he gathered party members for their annual national meeting during the weekend. Now he’s challenged not only by the Conservatives-led opposition in government but also his own coalition partners on the left side of Norwegian politics, who seem to be stealing Labour’s voters. “Labour? They’ve become a right-wing party! I’ve joined the Reds,” former veteran Labour voter Kåre Inge Andersen told newspaper Aftenposten earlier this week. Andersen works for the railroad in the southern Norwegian city of Sarpsborg that’s been politically run by Labour for more than 100 years. Now, like many others, he’s lost faith in Labour’s commitment to working folks, its industrial policies and its leadership. Its policies and programs can, at times, be hard to distinguish from those of its alleged arch rival, the Conservative Party. “I just don’t like the three who are in charge ,” said rail terminal operator Jan Granberg. He was referring to Støre, deputy Labour leader Hadia Tajik and party secretary Kjersti Stenseng. “They’re not Labour folks.” Granberg said he’ll be voting for the Center Party now, convinced that it will be better at opposing reforms and consolidation programs that have reduced some services at the local level. Granberg also doesn’t think Labour is tough enough in making sure that wealthy Norwegians will carry a bigger share of the tax burden. Therein lies the biggest challenge for Støre and his colleagues as Labour continues to lose voters to parties with which it also needs to cooperate. Labour fell to claim just 24 percent of the vote in the latest public opinion poll conducted for Aftenposten and state broadcaster NRK. The Center Party, meanwhile, jumped a remarkable 4.5 percentage points to claim 16.9 percent. The Reds, the Socialist Left and the Greens party have also been surging ahead since the last parliamentary election in 2017, when Labour claimed 27.4 percent and Center had 10.3. The pressure is on heading into local elections this fall. Labour won fully 33 percent at the last local elections in 2015, compared to just 8.5 percent for the Center Party. Now Labour stands to lose political control in cities like Sarpsborg in the south and not least in Finnmark and Troms in the far north, two years after losing the parliamentary election for the second time in a row. Asked why he thinks Labour still lacks the voter support it once had, even after nearly six years of a Conservatives-led government, Støre claims it’s because the party hasn’t been able to draw enough attention to its actual policies. The party has been distracted by internal power struggles and then, not least, the sexual harassment complaints filed against former deputy leader Trond Giske. That’s also diverted media attention away from political issues as Labour was caught in drama. The highly educated Støre, who comes from a wealthy family and flew around the world for years as former Labour Prime Minister Jens Stoltenberg’s foreign minister, still isn’t seen as a champion of the rank and rile. 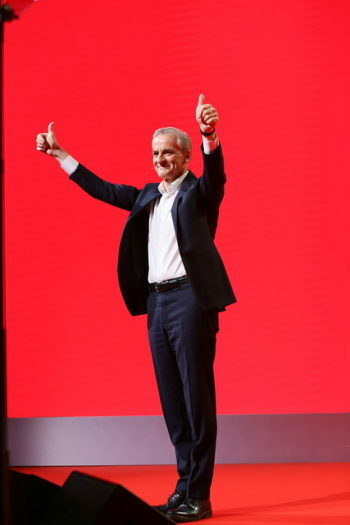 In an apparent effort to drop an “elite” image, he delivered his opening address at the meeting in an open-collared shirt with no tie, and even used more working-class language as he spoke without notes. He claims he’s still motivated to serve as Labour’s leader and is keen to point out that even though Labour sags in the polls, it ranked once again this week as Norway’s largest single party. “It’s the government parties that have lost the most voters, and lost their majority,” he said, even though the conservative government coalition has a majority in Parliament based on the last election. Labour’s actual policies, however, are subject to internal disagreement on a variety of fronts. Støre wants to develop the oil industry, mindful of the jobs it creates, instead of phasing it out. Others argue that phasing out oil, or at least halting more expansion and providing incentives for oil companies, is necessary in order to reverse climate change. The party was gearing for major debates and close votes on issues such as banning oil exploration off the coasts of Lofoten, Vesterålen and Senja (LoVeSe). Støre risked ending up on the losing side, as concerns rise that Norway’s biggest political parties haven’t been listening to Norwegian voters’ concerns about oil and climate change. Other debates raged over immigration policy, with many Labour veterans claiming that it’s become far too restrictive as a means of dealing with the Conservatives’ gains on the issue. Arguments also loomed over nuclear weapons and over how long women should be able to wait before seeking an abortion. Labour refuses, meanwhile, to acknowledge the general good health of Norway’s economy, or give the conservative government any credit for the lowest unemployment rate in 10 years. Newspaper Dagens Næringsliv (DN) reported on Thursday how deputy leader Tajik, for example, rather complains that overall employment levels remain too low. Instead of praising the roughly 100,000 jobs that have been created just in the last two years, Tajik thinks too many people in Norway remain outside the labour force. Støre and Tajik do seem to finally have placed the divisive Giske on the sidelines, despite dissent from Giske’s home region of Trøndelag and Giske’s own refusal to give up leadership ambitions. Giske’s replacement as candidate for co-deputy leader with Tajik, Bjørnar Skjæran, was firmly in place at the national meeting, making the rounds and blasting the Conservative government’s tax relief program. He’s a farmer from Nordland County, an advantage for the party as it tries to keep voters from defecting to the farmer- and district- friendly Center Party. Marianne Marthinsen, Labour’s former finance policy spokesperson, is also making a comeback after being sidelined herself by both Giske and Støre just after the 2017 election. Labour’s annual meeting was all supposed to be about fellowship, welfare, work, security, confidence and fairness, according to its own slogans that were summed up as Sterkere felleskap, rather like Hillary Clinton’s “Stronger together” slogan during the 2016 US presidential campaign. She lost. Støre hasn’t given up on winning yet.